This pastry case helps you sell more baked goods at your business, as the included (3) trays let you display your items for customers to choose from with ease. 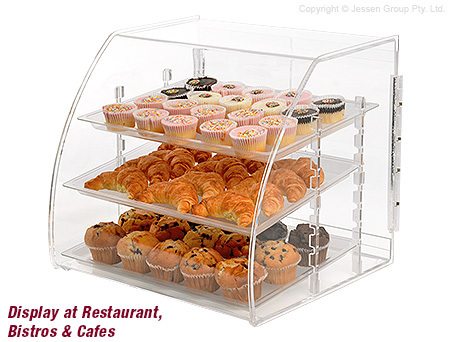 The acrylic bakery display uses food grade polycarbonate trays that fit into slots within the case at different heights so you can have items of different size in the cabinet! The top shelf may even be angled down to make viewing of items easier to help further entice potential customers. This bakery display cabinet, acrylic pastry case is made from 5mm thick clear acrylic that offers a full view of items placed within as well as a durable display that will last on countertops for years to come. The bakery display cabinet is 495 x 450mm to have a small footprint, with the tiered interior allowing many goods to be shown. Dual-swing doors on the back provide access to the interior so that employees can restock items as well as grab them after a customer has made their choice. Please Note: We recommend hand washing this unit with a mild detergent and water. Use a soft cloth to dry. Avoid using Alcohol, Ammonia, Chemical Based Cleaners or Abrasives. Washing in a dishwasher is also Not recommended.